I love a nice sweet pineapple, even though they are available all year round in the supermarkets, they still seem rather exotic. I've never had any difficulty in peeling and cutting a pineapple but was intrigued when I was sent an OXO Good Grips Pineapple Slicer to review. I'm hoping I will get better with practise, now that I understand how the slicer works! 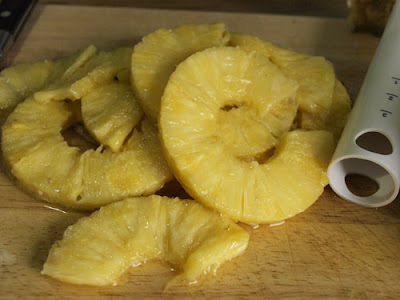 Here is the slightly mangled pineapple, oh boy was there lot of juice. 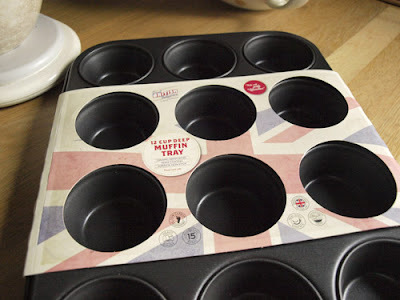 At the same time, I was asked to try this 12 cup deep Glidex Muffin Tray from Great British Bakeware by George Wilkinson The tins are ceramic reinforced and triple coated with superior non-stick, dishwasher safe and they even state that they are safe for metal tools. I liked the weightiness of the tin and the cups are a good size and, very importantly, they are British made, in Lancashire. The best way to test the tin was to make some muffins or cupcakes and I thought I'd bake some cupcakes that included pineapple, so what better than a combination of pineapple, rum and coconut. The Glidex Bakeware performed extremely well, I will try it without paper cases next time, perhaps with some savoury muffins to test out the non-stick coating. 1. Pre-heat the oven to 180C/Gas Mark 4. Line a 12 cup muffin tin with cupcake cases. 3. In a large bowl beat the butter until creamy and smooth. Add the sugar gradually, beating after each addition. 4. Add the flour in three stages, alternating with the milk and rum. Beat until the ingredients are combined and well blended. 5. Spoon the mixture into the cupcake cases, filling about 2/3 full. Bake in the pre-heated oven for about 15-20 minutes. 6. Cool in the tin for about 15 minutes. 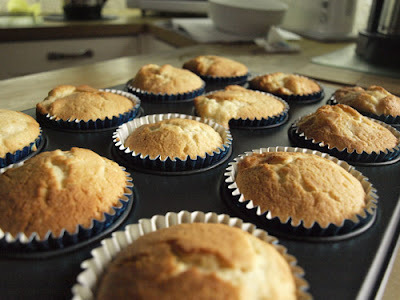 Remove from the tin to a cooling tray and cool completely before icing. 1. Put the chocolate pieces in a heatproof bowl that fits over a pan of very gently simmering water, allow to cool to room temperature. 2. Beat together the cream cheese and butter until smooth. Mix in the white chocolate and rum or rum extract. 3. Gradually beat in the icing sugar until the mixture is fluffy. 4. Spread the mixture over the cupcakes with a palette knife. 1. Toast about 50g (2oz) of dessicated coconut in a dry pan over a medium heat, stirring frequently and watching carefully so it doesn't burn. Leave to cool. 2. 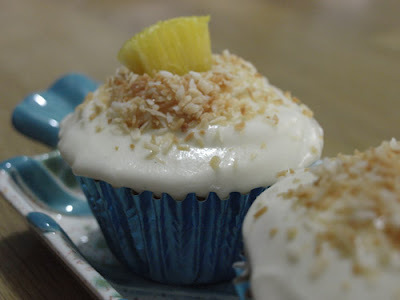 Sprinkle the coconut over the cream cheese frosting and place small wedges of pineapple on top. At first I was a little disappointed in these cupcakes, the cake seemed a bit cloying and stuck to the roof of your mouth. However, if you can be patient, they keep incredibly well, in an airtight plastic box in the fridge and improved quite dramatically after a couple of days. 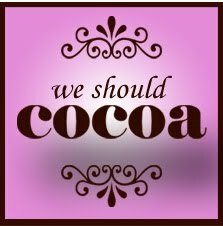 We should Cocoa is 2 years old and celebrating with Cocktail inspired chocolate creations. The challenge is run by Choclette at The Chocolate Log Blog and Chele at Chocolate Teapot. I'm entering the Pina Colada Cupcakes with their little bit of white chocolate in the frosting. The Calendar Cakes challenge from Dolly Bakes and Laura Love Cakes is celebrating National Cupcake week and apparently 'Caketails' are the latest cupcake craze, who says I'm crazy? And just to round things off, the letter for Alpha Bakes, hosted this month by Caroline Makes, alternately with The More Than Occasional Baker this month is 'P' which gives me a hat trick of cakey challenges. Looks like a good gadget if you often buy pineapples (in my case I probably buy them about once a year). :) Your cupcakes look very scrummy. Great video Janice. I must say the gadget looks like a lot of faff and I suspect a knife would be a lot easier and create less waste too, but it was fun to see it in action. I thought I was getting some Wilkinson bakeware to review, but I got the wrong Wilkinson and ended up with a load of plastic toy cutters for tiny tots - err, not exactly what I wanted! Your cupcakes sound delicious. Thanks for entering them into WSC. Nifty gadget and great video too - I don't think I could eat a whole pineapple before it started to ferment though! The cupcakes look lovely, a pity they weren't to your taste. I've never used pineapple in anything but an upside down cake so thank you for pointing out the error of my ways. I shall look at fresh pineapple with fresh eyes now! 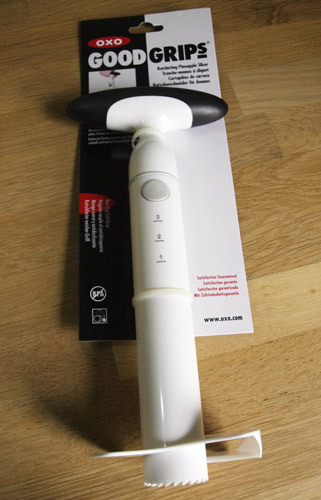 Plus Oxo gadgets rock! you can grip my shaft and twist my nob off any day Janice and if it comes with those divine pina colada cupcakes and your gorgeous accent then i'm a happy man! Oh Dom, don't! My face is aching with laughing. Loved the video, good on you! 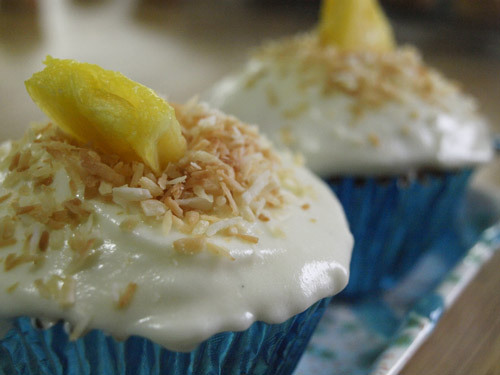 As for pina colada cupcakes, a winner for me. I adore the pineapple and coconut combination, but would still rather have it as a cocktail. Brings back memories of a holiday in Mexico! I quite fancy trying that gadget I'm rubbish at preparing pineapple with a knife. Those cupcakes look ridiculously yum - fun for a party. Loving the cupcakes, especially the chocolate int he cream cheese frosting which I would never have thought of doing. I have a pineapple slicer. Not sure if it is a different one though, as I just twist mind and then pull it out. Will have to have a proper look next time. I do think it is a great gadget though. Absolutely Brilliant Janice. You are such a pro - good idea to do a video review on how it works. Love pineapple and coconut combo. What a great way to use your new gadgets! Enjoyed your video! I never think to buy fresh pineapple as it's such a faff to cut up, maybe I'd change my mind if I had one of these. They're quite sticky though!! I like the use of coconut yogurt, and I bet the cream cheese frosting is yummy! Thanks for entering this in Alphabakes!